Belgium’s equivalent of the Eiffel Tower, the Atomium was never expected to outlive the exhibition for which it was built in 1958. The first major international fair after World War II, the event brought together nearly 40 nations and was in many ways a precursor to modern-day Brussels, the home to permanent representations of 28 European Union member states, as well as the Belgian bases of non-EU nations Russia and the United States. The Atomium, designed by engineer Andre Waterkeyn, was Belgium’s big national statement. It represents an iron crystal magnified 165 billion times and it is made up of nine metal spheres, or atoms, connected by tubes. The official publicity insists on its resistance to “any form of classification”, while broadcaster CNN placed The Atomium at the top of its ranking of Europe’s most bizarre buildings. In terms of summing up Belgium, the embrace of atomic structure reflects Belgium’s metal smelting industry, at the heart of the Coal and Steel Community from which today’s European Union grew. 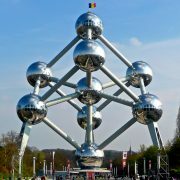 The name Atomium is an alloy, so to speak, of the words atom and aluminium. The sensation of mild sea sickness as you move between the slightly swaying spheres via space-age escalators is also relevant: the structure is stable only because it bends; without movement, it would break, just as Belgium’s French and Dutch-speaking communities are constantly forced to be flexible and pragmatic in order to maintain national unity. The charged atmosphere of the 1958 world fair is summed up in the novel Expo 58, published in 2013, by Jonathan Coe. Coe has thrown some of his critics by opting for a blend of humour that hovers between satire and broad, blundering comedy, but in Belgium his understanding of the weird magic of the Atomium and the melding and clashing of nations that continues today, rings very true. Despite its own mixed reviews, the Atomium draws around 600,000 visitors a year. A 2006 revamp has buffed up the shimmering globes, but facilities (toilets, for instance) are still on the Spartan side and queues can be horribly long, especially in the summer months. The biggest reward is the view from the top. You can take in Brussels from on high from the viewing gallery or savour it from the pricey panoramic restaurant. Photo Copyright © www.atomium.be – SABAM 2009 – Frankinho.